A pioneer in the Arabian horse industry, Eileen has enjoyed a lengthy and prestigious career and is recognized worldwide as one of the leading authorities on the breeding and marketing of Arabian horses. As a trainer, judge, and consultant, she has won numerous prestigious international awards which stand as testimony to her dedication to the Arabian breed. 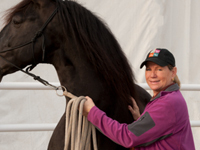 Originally from Colorado, USA, Eileen’s reputation and international exposure led her to the Middle East where she became influential in developing a number of regional horse breeding programs. Now based in Dubai, UAE, she has been instrumental in the reintroduction of the Arabian horse into the region and has placed more than 400 horses in the Gulf States. Eileen Verdieck and her professional team at HoofbeatZ™ work tirelessly to bring people and horses closer together in new, exciting and revolutionary relationships. Eileen is the creative director responsible for the unique Al Saheel show and HoofbeatZ™ corporate entertainment functions. She designs most of the acts and costumes herself and can often be found in her workshop covered in glue and glitter or wiring LED sets together to attach to the horses. She has also developed a series of riding courses based on natural horsemanship techniques. These are designed to encourage people to learn how to ride intuitively and safely much more quickly than conventional methods. She is an inspiring and dedicated teacher and her approach has won much acclaim from her students and visitors to HoofbeatZ™. 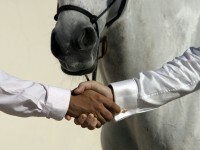 Lisa started her involvement with HoofbeatZ through her daughter’s love for horses, who was our first client student. Lisa has worked as a volunteer helping from managing the client bookings, client calls, front desk support, show support and pretty much everything that needed attending to. While she works as a volunteer her passion for the values of HoofbeatZ and its mission statement is exemplary.